I am the first to admit it's a struggle for me to get my daily water in everyday. Blah, water can just be so boring. ZENFUZE Water Bottle is not the average everyday water bottle, it's special. It has a camber that allows to you add healthy items to your water for flavor. 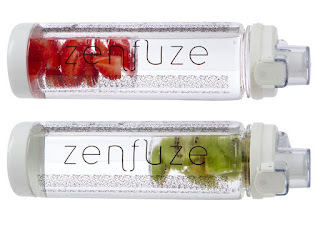 My favorite way to use the ZENFUZE Water Bottle is to add frozen fruits or berries to the camber. Not only does it keep your water cool it also provides a great flavor treat. I really like the fact that the bottle lid is clear and also white. It makes it easy to notice if the bottle has not been cleaned properly. Plus the bottom of the bottle unscrews for easy access cleaning and adding flavors. The bottle is 27 oz, clear, has a flip top and wrist strap. I received a code to order my bottle via amazon, I have prime so it shipped quickly and was very well packaged. We have taken a fresh look at water bottles and fruit infusers. We have shamelessly looked at all the best ideas around and fused them into one product. Test out for yourself whether you prefer your fruit infused from the bottom or at the top. (We prefer bottom - the flavour carries on infusing even in a half used bottle). But hey! It's a free world - you can choose. Designed in Europe - we chose a very minimalist design - but also extremely cool. And the use of the white material is not just so it looks nice. We tested other (darker) colors and noticed that they were much more difficult to see when they were completely clean. Do you know how sick you get when drink water that is in contact with algae or mold? And because both the top and the bottom are removable - you can be sure you can easily clean all the parts. The benefits of drinking more water are well documented: Fat Burning - Hydration - Strengthened Immune System - Weight loss - Improved digestion - and with Zenfuze - it's so easy to do, and the cost is minimal. It's a great alternative to those expensive flavoured bottled waters. With its cool design, you can be seen anywhere with this bottle: indoors, outdoors, sports, gym, yoga, running, biking, in the office, traveling. And it's car friendly too - fits most car cup holders. A disclaimer and disclosure: * I received one or more of these product in exchange for a review. I was compensated with product or payment for my reviews however, all my opinions are my own, based on my personal experience with the product. I am disclosing this in accordance with the Federal Trade Commission’s 16 CFR, Part 255: Guides Concerning the Use of Endorsements and Testimonials in Advertising.